Taraji P. Henson rocked the stage on Saturday Night Live last night, but one of her best sketches actually worked thanks to the inclusion of Sesame Street characters like Bert, Ernie, Snuffleupagus and Big Bird. 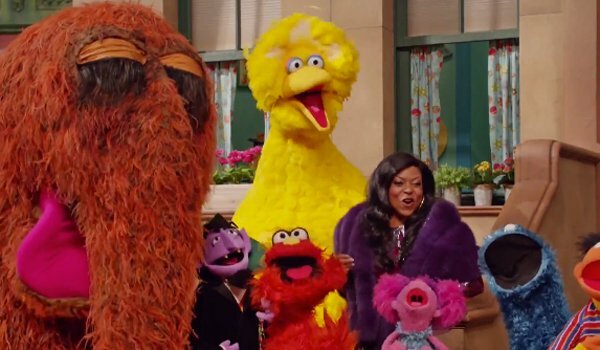 Here’s what a very adult version of Sesame Street might look like, thanks to a guest appearance from Henson’s Empire character Cookie Lyon. SNL’s fake commercials are frequently among the most amusing sketches the late night series puts together, and it doesn’t really surprise me that this mash-up of two fandoms manages to be so simultaneously absurd and chuckle-worthy. Most of us have grown up with some form of Sesame Street in our lives—whether we watched as children or shared with children—and to see Taraji P. Henson cause havoc on the set as her outrageous Empire character is so totally adult in comedy compared to the segments the Sesame Street characters will typically engage in, which include cutesy appearances on Good Morning America and reading nostalgic tweets on The Tonight Show Starring Jimmy Fallon. I’m a little surprised the Muppet characters actually agreed to pop up on the SNL sketch, but I’m pleased all the same. Toward the end of the commercial segment, the gang even teams up to sing the traditional “Sesame Street Theme” song. The good news? They crush it, and Cookie Lyon believes she can work with them at Empire Entertainment. Taraji P. Henson’s SNL episode also featured an appearance from Billy Crystal and a funny Game of Thrones parody.